Traditional styling with button tufting and brass nailhead trim. Genuine hardwood frame with a rich mahogany finish. Padded arms for comfort and support. Handsomely appointed and attractively priced for the fiscally discerning executive. Traditional styling with button tufting and brass nailhead trim. 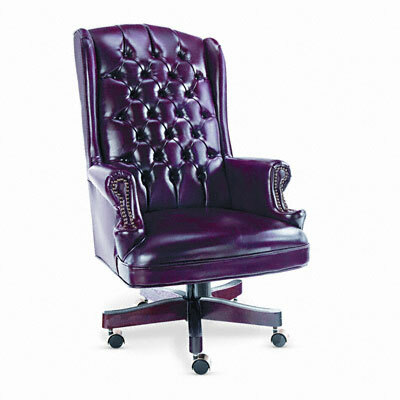 Deep cushioned vinyl upholstery. Genuine hardwood frame with a rich mahogany finish. Padded arms for comfort and support. Five-star base with casters for easy mobility. Arm Height From Seat 7 1/2"
Distance Between Arms 29 1/4"